Versatile, economical and strong. Expanded metal picnic tables, a great solution for outdoor seating and dining. Ultra-convenient walk through design provides maximum comfort, inclusion and accessibility. Key to the structural strength, not only does the diamond pattern offer the prime load advantages of steel at a more portable weight, but its porous design allows for a quick drying time after rainfall. The MIG welded frame is the paramount of stability, a 2-3/8"O.D. steel tube with 1"O.D. support braces. 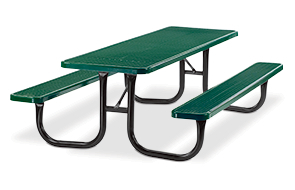 These all steel extra heavy-duty rectangular picnic tables feature top-of-the-line weather and vandal resistant finishes. Tables are available in a popular selection of color options—polyethylene finished tops and seats, the frames are powder-coated. This strong, commercial grade picnic table is available in 4', 6', 8', Universal Access, 6' & 8' single and 8' double sided ADA compliant lengths.